Are you lighting a soul on fire? Or burning someone with your OWN soul? This seems like an important distinction. Works very well with Malchezaar's Imp, seeing 2-ofs in Standard List and 1-ofs in Wild. Was my favorite card before the nerf. I feel it lost its "feel" now that it costs mana. Much more harder to go Malygos Double Soulfire for instant 18 damage. this card is garbage, even with 7 other cards in your hand the chance to discard something you need makes it totally unplayable unless you're playing a deck that just dumps its hand onto the board fast as possible. I played MTG for years before ever playing Hearthstone and Raymond Swanland always was and still is my favorite artist for card artwork. His art always looks so intense and chaotic and alive. Seeing it in motion just makes it even better. I'd like to mention, that Soulfire is by far a bad card now: Just not good enough to make the cut in top tier decks. I run Azure Drake / Soulfire as a replacement finisher in my Budget Zoolock I cite below and it works just fine. If you manage to also hold a Darkbomb, you can rush the opponent down from 9 health without board and through taunts. While I know, that the top tier finisher for Zoo, Doomguard, is only a rare, but Azure Drake is much more versatile and I'd suggest players with limited resources to craft Azure Drake over Doomguard any time. So no more Turn 4 Mountain Giant into Soulfire? Sounds like a dead handlock to me. 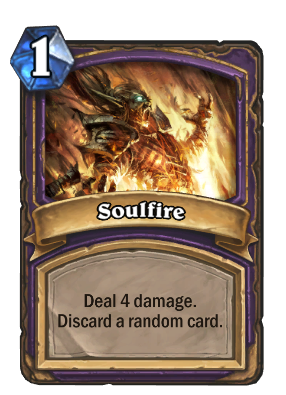 It's funny how they nerf Soulfire to slow down warlock rush decks, and have absolutely no clue as to how this will affect other warlock decks. If they were to nerf Zoo/Aggro, they should have done something else that can only affect Zoo/Aggro, not something that will cause a ridiculous collateral damage. Almost guaranteed to lose the 1 card you want to keep! Haha. Has a tendency to discard anything epic or better in hand almost all the time. What happens if you play this card without any other cards in your hand?